Lets make sure something is clear from the get go. 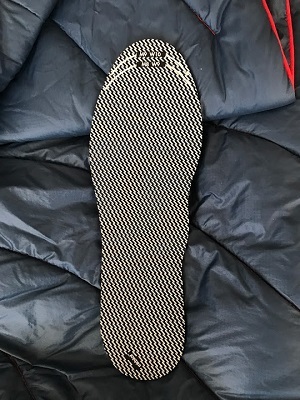 These insoles are not a replacement for a product such as Superfeet. Inkblaat insoles provide no arch support. They are purely a thin layer of soft and squishy material. This is where the initial problem I have with these insoles comes into play. Inkblaat advertises that the “slim profile works with, or in lieu of, most shoe and sneaker liners”. So far I’ve not found that to be the case. I benefit greatly from a bit of arch support. 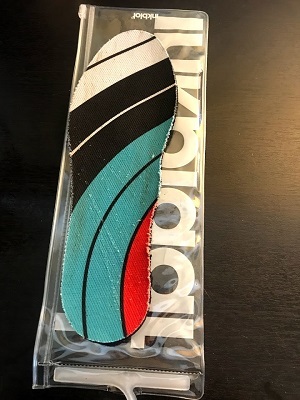 Normally when I get a new pair of shoes I remove the insole that comes with the shoe and replace it with a more robust set of arch supporting insoles. Unfortunately, the majority of shoes I own don’t have enough volume for both a pair of Inkblaat insoles as well as a normal insole. Even in shoes where I’ve not replaced the insole there isn’t enough volume within my shoes to use both a supportive insole and the Inkblaat insole and I’d hesitate to think that any properly fitting shoe would have room for both. Here are the Inkblaat Insoles next to a set of blue Superfeet. As you can see the Inkblaat Insoles are fairly thick in comparison. While that thickness does provide a good amount of cushion it can make it difficult to fit into properly fitted shoes. In order to test these insoles I’ve been forced to wear them without any kind of additional arch support. Consequently, it’s difficult for me to judge their actual comfort. I can say though that even without arch support I did notice a nice cushioning of my feet. If you are someone who prefers your shoes to be very “flat” on the inside these might be the most comfortable thing ever. Keep in mind that comfort is very subjective and I can only speak to how these work for my personal needs. I dig the funky patterns Inkblaat uses. The “cut here” sizing guidelines are a nice touch as well. The other advertised feature is their ability to withstand machine washing. This was what caught my eye initially. After a week of wearing these daily to the gym I took them out of my gym shoes and tossed them into the washer. When I pulled them out they were noticeably less “squishy” and fairly beat up. It’s difficult to capture the change in “squishiness” visually but if you look closely you can see the jagged edge where some of the foam is missing and the overall scratching and fraying of the top layer. I also noticed I had a bunch of little foam chunks from the insoles stuck to the clothes I washed in the same load. 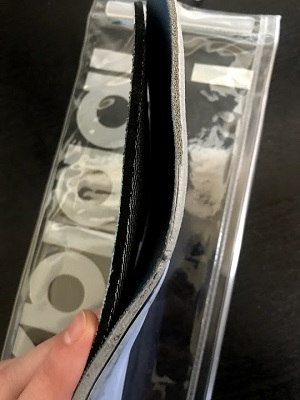 I investigated the packaging that came with my pair of insoles as well as Inkblaat’s website, to see if I had not correctly followed the washing instructions, but couldn’t locate any care directions other than them being “machine washable”. One thing to note: prior to washing them they smelled like you would expect… like nasty feet. After washing them they smell fresh and clean. Notice the scratches along the surface as well as how chewed up the right side of the insole is. I’d hesitate to put these through another cycle of my washing machine. Prior to washing they looked like they were fresh out of the package. 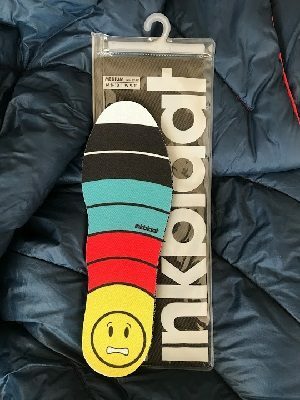 While my experience using the Inkblaat Insoles wasn’t the most positive I think they could be a great product for the right individual. If you like the idea of a removable washable insole and have a pair of shoes that are slightly too big they could be the perfect solution – you might want to hand wash them though. NOTE: I received these insoles free of charge from Inkblaat in consideration for a gear review. This entry was posted in Activities, Activities, Alpine Mountineering, Activities, Hiking, Brands, Inkblaat, Product Review.